I had an insanely productive morning this morning. In addition to the usual morning routine (dog duty, cappuccino-making, getting ready for work, and lunch-making), I also managed to unload the dishwasher, clean the kitchen, and get dinner in the crock pot. In the midst of my cleaning frenzy, I found husband’s wedding band. He was already at work. Sans his wedding band, obviously. This happens ALL the time. See photo below. 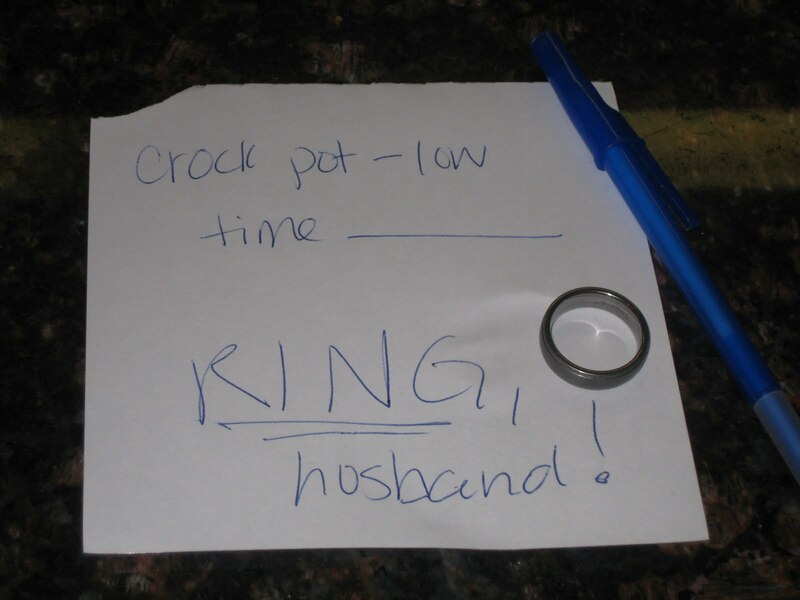 THIS is what I put on a scrap piece of paper on my way out the door: directions for him to start the crock pot at noon…and to put on his #$*& wedding band. Mennnn…. Last night we had a favorite “convenience” dinner. 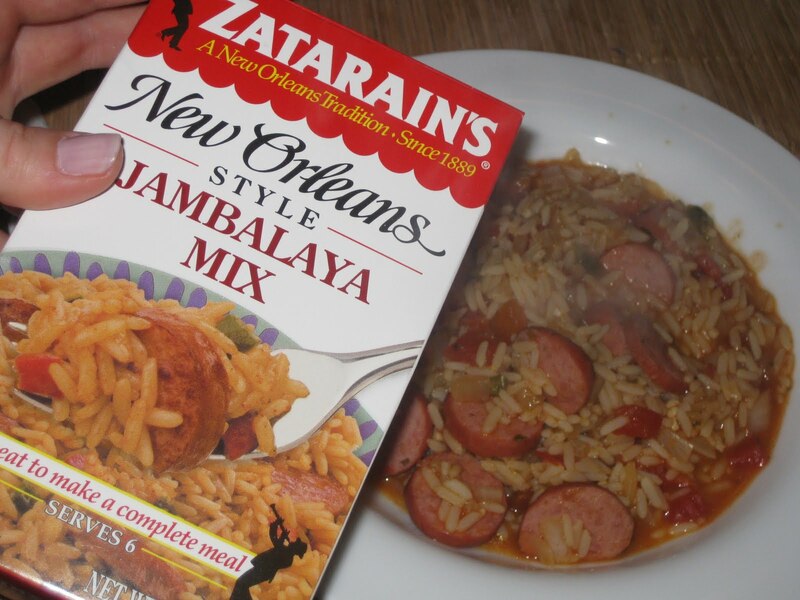 I’m not really into convenience foods, but I must say…Zatarains does Jambabaya right. The calories are low (130! )…but the sodium is a bit high (540 mg)…could be worse. There’s only 1 gram of fat per serving, which is also great. 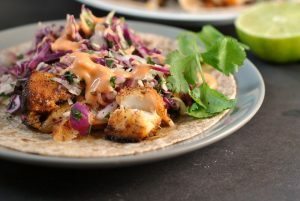 I just wish it came in a whole grain, low-sodium version…then, it’d be perfect! Anyways, I add to the mix a whole chopped onion, minced garlic, 1 can of low-sodium diced tomatoes, Tabasco sauce, and either shrimp, chicken, or turkey sausage. Last night, we opted for turkey sausage. Boot camp tonight went…well. I will DEFINITELY be sore tomorrow. Tonight we focused on triceps with lunges and squats thrown in there. Cardio, too…running, stairs, etc. I’m really enjoying it, though…and I love that the routine is different every night! A HUGE THANKS to Kay’s Naturals who sent me a wonderful array of products to sample and review today. 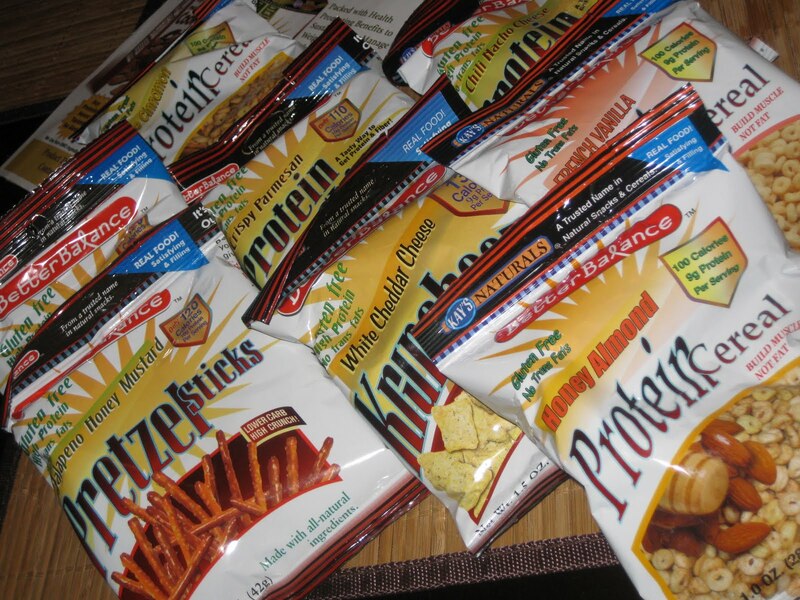 Kay’s Naturals carries gluten-free cereals, crackers, chips, and snack foods. Kay’s products cater to the gluten-sensitive population, as well as diabetes and bariatric patients. Today I tried the Lemon Herb Protein Chips and they were DELICIOUS! 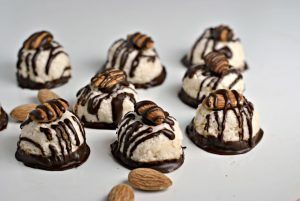 I ate them on my way home from work, before boot camp. There is an abundance of flavor and crunch, I highly recommend them, especially if you enjoy a lemony taste…mmmm! Gluten allergies are becoming more and more common it seems. Similarly, the number of gluten-free products on the market is continually growing — some being MUCH better than others. Most larger retailers offer gluten-free cereals, crackers, breakfast bars, pastas, and chips. Thank you, Kay’s Naturals for supplying such wonderful tasting, gluten-free products! I look forward to sampling and reviewing more varieties! Question 1: Do you know anyone personally with Celiac’s disease or a gluten sensitivity? Question 2: Going back to my husband-who-forgets-his-wedding-band-all-the-time rant…what does YOUR significant other do that drives you absolutely insane? Question 3: I’m traveling next week and looking for book suggestions…have you read any page-turners lately? Do share!